Iowa Sunroom Building – Patio Room Addition Window Construction Project Ideas. This Could Be Your Sun Room! Before you buy a sunroom there are few things you have to consider about. The purposes of purchasing your sunroom, the amount you can afford, whether you will use the latest technologies & amount of time you will spend are some of the common things. Mentioning about the price, an average sun room cost about $200 per square foot. It’s worth being aware of what you are buying than worrying after you purchase it. Sunrooms FTW!! via Tag Surfer ‹ Mrsteverone’s Blog — WordPress. People love sunrooms. It’s a fantastic way to extend your home’s living space. It’s also a great way to enjoy the out of doors without exposure to rain, sun and bugs. You can continue to bring more of the out of doors into your home by adding plants to your sunroom. Plants add a nice element to any room in your home. They’re calming, beautiful and can help a room feel alive. Adding plants to your sunroom just feels natural. However, you probably don’t want to use the same outdoor planters and delicate indoor vases. Instead, you may want to use a planter that offers both durability and an indoor furniture appeal. Consider using wicker and rattan planters in your sunroom. Wicker and rattan are both durable. They’re also made from natural elements so they’ll fit nicely in your sunroom. They’ll look decorative without stealing the spotlight from your plants and other decorative accessories. Additionally, Wicker is a natural sunroom material because of its light nature and its ability to stand up to the sun’s rays. Wicker planters are also versatile. You can buy them in just about any shape, size and color. For example, consider using hanging wicker baskets for the walls in your sunroom. They’ll support annual flowers or year round plants. Wicker plant stands work quite well along the wall in your sunroom. Some stands support two plants stacked on top of each other. While others are rectangular and support a whole row of your favorite flowers, greenery or ferns. Ferns are actually great sunroom plants because they don’t require much maintenance and they look beautiful year around. You can also get creative with your wicker planters. For example, a bicycle with wicker baskets at the front and back is a unique decorating item. When choosing plants for your sunroom consider their exposure. How much sun will they get? 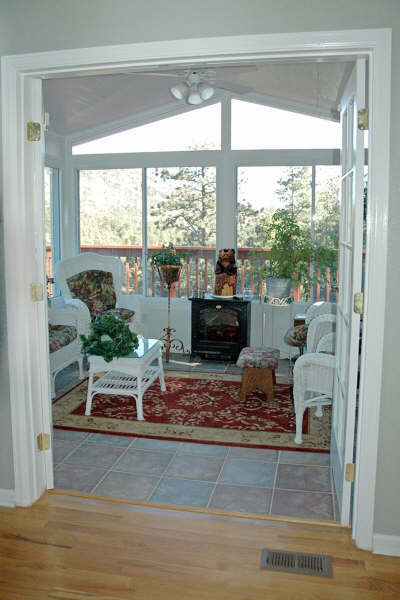 Is your sunroom heated in the winter time? Is it air conditioned in the summer time? IF you have a sunroom that has year round temperature control then you can choose to display just about any house plant you desire. Spider plants, the Peace Lily and the Golden Pothos are all very hearty plants that are great for beginners and experts alike. They’re also good for filtering your indoor air. If you have a sunroom that is warm year around consider palms and bromeliads. Live in a desert area? Consider cactus and succulents. And of course if you have an indoor/outdoor space you can plant annuals in your sunroom to bring the two spaces together. Adding plants to your sunroom is simply a matter of examining your space and temperature. Choose the planters that fit the size and shape of your plants and your sunroom design. Consider wicker planters because they’re durable, versatile and add the perfect touch to any sunroom. via How Plants Can Accessorize Your Sunroom | Sunrooms Southern New Jersey. If you’re a homeowner going over ideas for a remodeling project, have you ever considered a sunroom addition? Sunrooms are popular with homeowners for a number of different reasons. Not only do they add a relaxing, welcoming place to entertain guests but sunrooms are popular because they are known as a place where you can relax and spend some letting your body and mind recharge. Think about this: You could spend a relaxing day in your sunroom, enjoying breakfast while you read a book under the morning sun. You could spend summer days entertaining friends over lunch, or having a relaxing dinner as the sun sets in the background. Not only that, but your new glass sunroom would allow you to enjoy the outdoors not matter what the weather was like. If you’re the sort of person who enjoys rainstorms, having a sunroom attached to your house would let you sit and enjoy one without getting wet. The versatility of a sunroom addition is another reason why it’s such a hit with many homeowners starting their own home improvement projects. It can not only be used for entertaining guests and relaxing on your own, but you can use it to exercise, create, play games or do anything else that allows you get away from the hassles of everyday life. Because sunrooms are glass enclosures, they make use of the sun for both light and heat, leaving little need for the use of electricity during the day. Using materials that are especially energy efficient is a good way to maximize the enjoyment of the new addition to your home while keeping your utility bills down. With these qualities in mind, it’s easy to see why so many homeowners like having sunrooms as a part of their homes but, like with many other home remodeling projects, there are things to keep in mind when you want to build a sunroom addition. The one thing you have to consider with a sunroom is the cost, as this addition can be expensive depending on the materials used to build it as well as the labor. Consider not only the type of sunroom, but the material of the walls and the type of glass used in the build as well. * Screen Sunroom – This is perhaps the most economical type of sunroom that you can buy. The walls are made of mesh to allow air in, but not insects. The main drawback is that it can typically only be used during specific times of the year, particularly spring through fall. * Seasonal Sunrooms – This type of sunroom addition is also typically meant to be enjoyed from the spring through the fall. Like screen sunrooms, these rooms are economical and not meant to be heated or air conditioned. * Knee-wall Rooms – These rooms are popular because they are made up of walls that are windowsill height, at which point they continue into large glass windows. * Conservatories and Solariums – These rooms are among the top tier as far as both cost and luxury are concerned. They are full insulated, built for heating and air conditioning and completely encased in glass. Keep in mind that they often need permits in order to be constructed. The type of sunrooms mentioned run the gamut as far as build complexity and cost goes, so always consider what you can do within the confines of your budget before you commit to anything. After all, not only does the style of the sunroom addition factor into the overall cost, but the materials do as well. You have to consider the type of glass, like single glaze vs. double glazed, for instance, when planning your sunroom. You also have to figure out what kind of walls you want. Some walls, like those made of aluminum, are strong and inexpensive, but not very good at insulating heat. Wood is another example of a material with both good traits and faults: It’s beautiful to look at, but requires much more attention to maintenance than most other building materials. Are you interested in home remodeling or learning more about home additions in general? Starcom Design/Build has been helping home owners in Towson, Lutherville, Owings Mills, Columbia, and Ellicott City Maryland create the prefect bathroom remodel, sunroom addition, and custom kitchen cabinetry for over 20 years. Contact them today and get expert help with your next home remodeling project. via The Basics of a Sunroom Addition | Sunrooms Southern New Jersey. Across Iowa our Designs and have become the focal point of every day living. Casual ,Better Living, in tune with the times. A Room Addition Plan, where home interiors make comfortable transitions to the Outside or backyard. A Living space where families casually entertain, play, work on their hobbies, garden indoors. Plus Add an extra dimension to your life by adding one of our quality-designed and built rooms…the possibilities are unlimited. Once you experience The Great Living In one of our additions– you will wonder how you lived without one before. Whether it is Planning our 4 Season Addition, or our Three Seasons Enclosure Designs. We Have Got You Covered. We Have many Styles on Sunrooms ,Colors, Roofs, Sunroom Vinyl Windows ,Vinyl Decks, Decor, Sizes, Plans, Kits, Blinds, designs, Price and Quote ranges . via Fantastic Four Season Sunrooms by Team,3 Seasons Sunroom Design Ideas Plans. Trying to Get on The First Page for the Keywords Sunroom and Sunrooms. I Have done Super Pages, Yellow Pages, Yelp, Manta, Linked, Back linked, Exchange Links, and even Plurk’ed and Countless More, Un till I am Blue in the Face .Then I see Some Website that are on The First Page For Saying Sunrooms or Sunroom Once, Is this Crazy or What? Attention: All Of you Robots out There, My Keywords are as follows, Sunroom, Sunrooms, Got it? If you Are Worn Out, like me Please Visit My Page on http://www.sunroomsbyteam.com. Please put a Link to my page on Your Site using My add url page and I will do the Same, Or send me any Ideas You Have on This Dilemma, Thanks for your help, Steve Sunrooms by Team.